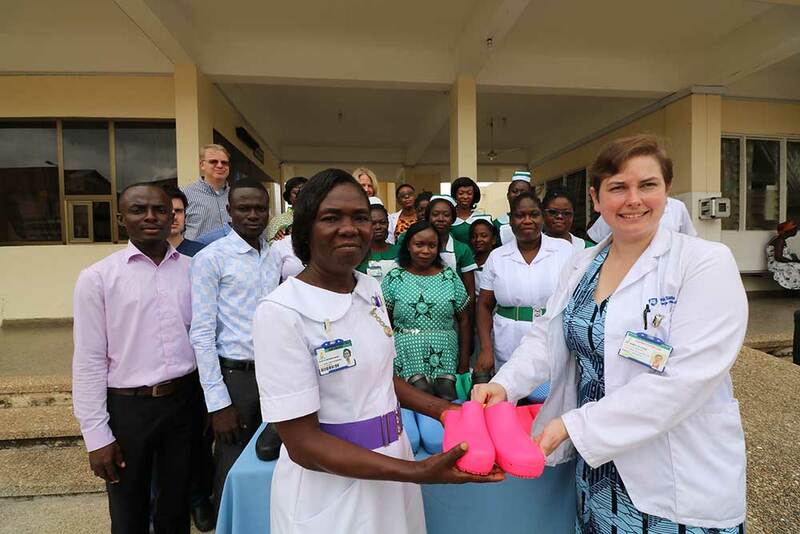 Penn State College of Medicine Global Health Scholars student Becky Koob, right, presents donated hospital-grade shoes to Gladys Ampomah-Ababio, head of nursing at Eastern Regional Hospital in Ghana. Penn State College of Medicine student Becky Koob took the old adage “walk a mile in another’s shoes” literally when she volunteered at a hospital in Kofordua, Ghana, last summer. After working long days at the Eastern Regional Hospital in worn-out footwear, she decided to do something about it. Koob contacted multiple shoe companies asking for donations and found a willing partner in Calzuro, Italian-made shoes distributed in the U.S. from a base in Ohio. The company donated 120 pairs of hospital-grade shoes and galoshes that can be put in an autoclave to be sterilized. During her first trip to Ghana as a first-year medical student, Koob settled on becoming a surgeon after she was able to shadow the hospital’s only surgeon on weekends. Gaining perspectives like that along with firsthand experience over two separate visits makes the 10-year-old Global Health Scholars program particularly attractive to medical students, who increasingly value cross-cultural experience. To be considered for inclusion, a country must have both a College of Medicine faculty champion and an international partner engaged at the site, and the country must be considered safe, he said. Participating countries are Zambia, Peru, Australia, Japan and Ghana.